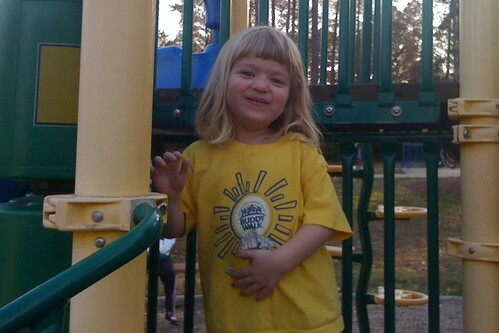 This past weekend, Catie and I went to the playground. We’ve been doing this a lot lately, since the weather has gotten nice. We have a neighborhood playground which is ok but a little small; there’s a much nicer public park with a bigger playground about a mile and a half from our house. Catie particularly likes the sand pit. She also likes the play structures, but usually she just walks up the stairs, hops around at the top, then climbs back down. She’s always hated slides and swings. I honestly don’t know why, she’s just a cautious kid, and she doesn’t seem to like motion that she doesn’t feel 100% in control of. She doesn’t care for tricycles either. Honestly, yes, I find this behavior a little strange, but I also try not to spend much time worrying about it, because I think most of it is stuff that she’ll outgrow in her own time. So I held both of her hands, and she scooted herself down the slide. And then she did it again. And about 25 more times after that. I was stunned. I couldn’t take any pictures of her in action because I had to hold her hand to get her to go down the slide, but one of the times she was running back up the stairs of the play structure, I tweeted about it. I was so proud of her for breaking out of her comfort zone. I think she was pretty pleased with herself too. After the playground, we celebrated by going out for Mexican food, just the two of us. Such a fun day. And I know it’s probably a cliche, but there’s something about having a kid this age, she seems to do some new amazing thing that completely surprises me every day. I love that. And I cannot wait to see what this kid will do next to knock my socks off. 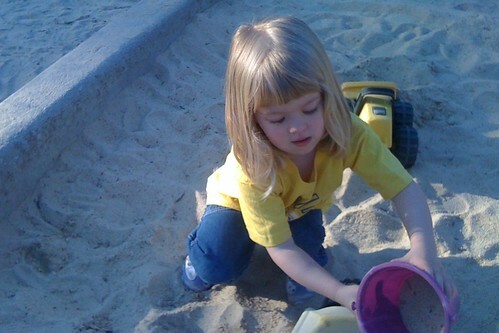 This entry was posted in Cate and tagged anxiety, Catie, fears, playground, toddlers by Cindy. Bookmark the permalink. Aw, that’s awesome. It’s such a gift watching them grow into little people and witness their accomplishments. Yep, every kid has their comfort zone just like us adults. Its hard for all of us to move out of it. Go Catie! .-= Lizard Breath´s last blog ..Wonderful weekend =-. omg i remember the 1st time hannah did this it was SUCh a huge thing. yay for catie! .-= Becky ´s last blog ..Weekend recap =-. .-= Heather @ Domestic Extraordinaire´s last blog ..Weekly Winners-The Three Six Five Edition =-.